Even when the Kodak DCS100-hardware (DSU!) seemed to work. That’s the reason I started this post. The times I used my 1,3 MP Kodak/Canon DCS3c in 1998, I had to use a Windows NT/2000 PC. I can't remember which SCSI-Board I used, but it worked without any problems. After changing the PCMCIA-HD of my DCS3c to a PCMCIA-adaptor with 96/128/256 MB Compactflashcards, I wasn't forced to use SCSI any longer and took a simple CF-Cardreader. Not one of this three cameras produces connection-problems with SCSI – on Mac! I really wonder that nobody owning a Kodak DCS100 set tried to connect the DSU to an old Apple Mac. Or did one? OK, Mac Software/Mac Kodak (Photoshop) plugin would be required! Is there a chance for better DCS100-News in 2016? Some Photos taken with a Kodak DCS100 in 2016 +? Or can some Kodak DCS100 archive-files be found hidden somewhere in the world? Forgotten on a HD or Server? To extract Kodak DCS100-photos out of the archive-file, even if they are more than 25 years old. It needed some time for me to understand that special DCS100 (archive) file format. But in my opinion it can't be so much different from the big single file you can produce writing all 50 photos taken with the successor Kodak DCS200ci to one big archive file via Photoshop Plug-in. Or are the archive-file-formats of the Kodak DCS100 and DCS200 completely different? To be opened only with the DCS100 Windows TWAIN or the Mac Photoshop Plugin. I would really like to see some genuine DCS100-photos! January 2016 I wrote a blog-post: "Kodak DCS 100: Die erste (in Serie produzierte) DSLR der Welt" - "Kodak DCS100: the first in series produced DSLR in the World." Based on a sample of the French Kodak-Issue „le courrier PROFESSIONEL“ from 1993. "Le courrier PROFESSIONELL" reported a photo-order from the end of the world – Cape Hoorn. 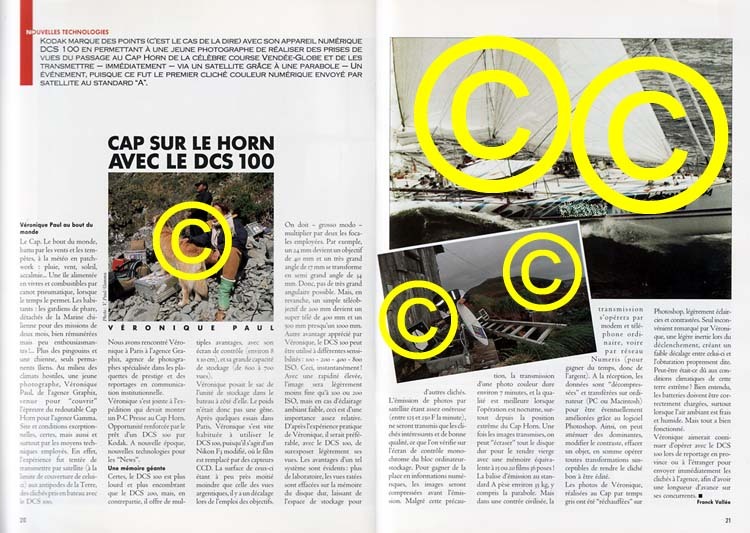 French photographer Véronique Paul should document one of the most toughest sailing regattas of the world, the "Vendée Globe Regatta" in color with the Kodak DCS100! To transmit the fotos via parabol-antenna and satellite 12.000 km (7.500 miles) home to France. How about trying an old Apple Macintosh with a working DCS100? Showing the world what was possible with this milestone of digital photography!